Welcome to Reykjavik! See Thingvellir National Park, an UNESCO World Heritage Site, check out the geothermal area of Geysir and stop at several spectacular waterfalls along the way. Upon arrival, pick up your rental car and check into your hotel. Hit the road for Thingvellir National Park, a UNESCO World Heritage Site. See where the Icelandic parliament was established in 930 AD and check out the geothermal area of Geysir. Stop at several spectacular waterfalls along your route to the Vik area. Start your day with a drive across the impressive black sand plain, Myrdalssandur. 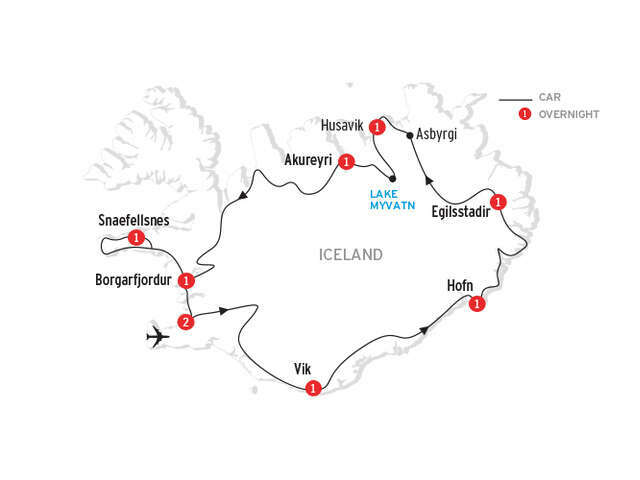 See stunning views of glaciers along your route to the oasis-like Skaftafell National Park, and hike the trails surrounding the Jokulsarlon glacial lagoon. Take an optional 30- to 40-minute boat trip to see enormous glaciers up close. Drive to the Hofn area for the night. Today, journey south through the sheltered East Fjords. In Stoovarfjordur, visit Petra's Stone Collection, one of the world's most complete collections of Icelandic minerals. Continue to the Egilsstadir area. Begin today's adventure with a drive through the lunar-like landscape of Moorudalur. Stop at the mighty Dettifoss waterfalls, then see Asbyrgi, a horseshoe-shaped gorge with impressive rock walls and abundant vegetation. Drive to Husavik for the night. Today, explore Lake Myvatn Nature Reserve, renowned for its volcanic activity and amazing bird life. Don't miss the geothermal area of Namaskard. Continue to Akureyri. Hop in the car and head through Skagafjordur, known for its famous Icelandic horses. Visit the museum at Glaumbær, travel through the Holtavorduheidi moors and stop for a dip at Deildartunguhver, Iceland's largest hot springs, on your way to Borgarfjordur. 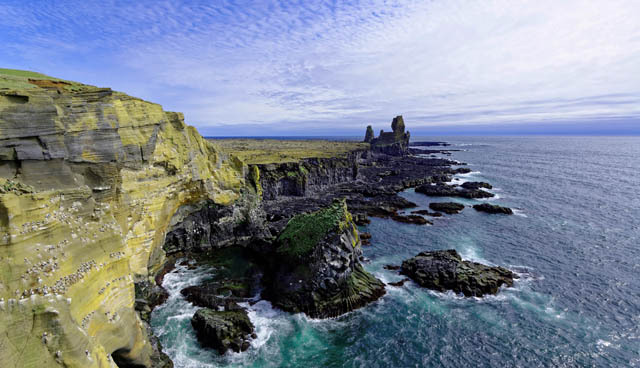 Today, the natural wonders of the Snaefellsnes peninsula await. Marvel at the stunning Snaefellsjokull National Park and the Snaefell Glacier that towers above the region. Continue your exploration of the area with visits to the ancient fishing village of Hellnar, the black lava pearl beach of Djupalonssandur and the 200-metre volcanic crater, Eldborg. Drive to Reykjavik for the night. Return your rental car at the airport and board your flight home. Stop dreaming and start booking! Call your UNIGLOBE Travel Consultant today!